As the time is changing and we are moving towards internet world, Google is the solution to most of the problem. We seek the help from Google before consulting a real expert. Using the internet for the marketing is one of the most popular marketing tools in current time and most of the organizations prefer online marketing over manual marketing technique, though manual marketing techniques are still popular. How to hire a great in-house search engine marketer is a question most organizations want to know whether it is small, growing or a large organization. The debate over in-house search engine marketer (or search engine optimizer) and hiring an agency is as old as online marketing and going to be the center for a very long period of time. In this article, we are going to discuss all in-house marketers and how to hire a great in-house search engine marketer, but first of all, let us know what search engine marketer is and what he does. Search engine marketing (SEM) is the type of marketing where search engine optimizer (SEO) or search engine marketers increase the visibility of the website on the search engine which helps in promotion and getting more business. The job of a search engine marketer is popular and in demand because of wide use of internet and dependability of people on a search engine. People choose a website for information rather than doing it manually and most of the businesses have their website to share all the related information. The online world is more convenient and easy to use as well as time savvy, which is really crucial in this fast pace world. The job of a search engine marketer is gaining popularity day by day and more business and organization chooses to hire an in-house marketer for the promotion and publicity. We can say that the search engine marketers are in demand, but most business organizations lack the knowledge about this job and how beneficial it is. They hardly understand the difference between hiring an in-house search engine marketer and hiring an agency to do it for you. The hiring of an in-house search engine marketer or an agency is totally depending on the nature of the business and on the plan. If a business plans to expand and hire more staff then in-house search engine marketer is a better option but if in any case, a business does not have any plans to increase the staff or expand the business then hiring an agency for doing the job is a better choice. We can say that hiring an in-house search engine marketer can be a good decision if you know how to use it for your benefit because most of the managers and leaders have an underlined pressure of expanding and increasing the business. It is a debate of this decade and chances are going to continue in next decade too because the internet is a crucial part of our life nowadays and going to be a more integral part of our life in near future. In-house search engine marketer or search engine marketing agency totally depends on your business and the need of your business because the nature of your business depends on so many other things which have a great influence on the overall success of your business. No one can say that one is good and other is bad, because in-house search engine marketer is going to be a good option or not depends upon the need of your business and how much you want to invest in this venture. This has its own benefit and own drawback and usually benefits overpower the drawbacks. Here we are discussing how to hire a great in-house search engine marketer. It is a timeless debate that what is the best in-house search engine marketer or search engine marketing agencies. Outsource or in-house both are good enough, but it totally depends on the nature of your business and how much you need it. If your business is small and you have no plans on expanding your staff or the business than outsourcing can be good for you. You can hire outsource like online marketing agency which can help you in achieving your goal within budget and you don’t have to take any responsibility. Outsource can also make your work easy because you don’t take responsibility for marketing on your own shoulder. On the other hand, in-source can help you maintain your own business with your own term. In-house search engine marketing is a responsible job and needs lots of attention and care to maintain and to keep in check. If you have a plan for expanding your own business and hiring new staff than in-house search engine marketer can really be your answer for promoting your business. In-house search engine marketers are a great responsibility and because the job is still new that’s why finding a talented and organized marketer is not that easy to find. So it is up to your business and needs that what is best for you in online marketing because online marketing is important in this era of technology and World Wide Web. Self-employment is one of the latest trends of the market. There are so many scholars choosing business world rather than doing a desk job and own their own business, whether it is a small enterprise or a medium scale. The growths of such businesses are impressive and increasing day by day because now more people are choosing this way to make the living. More businesses mean more competition and greater marketing skills to succeed which create the vacancy for the search engine marketer who helps in promoting your business. 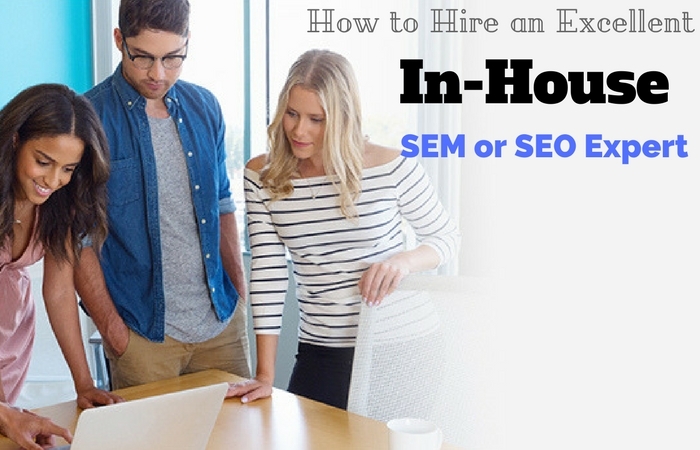 Hiring an in-house search engine marketer can be a crucial decision. You should know your business and the demand of your business before making any decision because hiring an in-house search engine marketer is a little harder to maintain compared to search engine marketing agencies. Search engine marketing agencies have a whole team of experts and they can focus on each minor detail as well as have experience of day to day promotion. On the other hand hiring experts for the different need for search engine marketing can be quite expensive and it is hard to have all the qualities in one person. So you must know your business and what is best for you. You can take help from experts on what to do and what not to do because ultimately this kind of decisions leaves a long lasting effect. Every business has its own need and as an owner, you should know it very well. It is your responsibility to understand whether you need inbound or outsource because both have its own benefits and drawback. It is a two-way road; you can only hire the best help for your business if and only you understand what your business actually needs. So, pay attention to your business plans and understand what are the needs of your business. You should know if you can manage the extra burden of hiring in-house search engine marketer or hiring search engine marketing agency, they can do it for you in the best possible way. You can hire a great in-house search engine marketer only if you know what you are exactly looking for, so understand the need of your business. Understanding your business is the very first step you take towards hiring a great in-house search engine marketer. You cannot find a better search engine marketer for your business if you don’t understand the need of your own business. Budget and cost are the two important factor of any business, whether it is small, medium or large because capital in the business is what matters the most. Budget and cost can really play an important role in your search engine marketing strategies because in-house and outsource both have their own set of benefits and drawbacks. In-house search engine marketing takes time, money and lots of headache to take everything on the smooth road, but it has its benefits which are far greater than a headache and time. The million dollar question here is that whether your business can take this step budget and cost wise or is it better to choose a safe outsource option. If you are strictly on the budget and cost, then you should really know your pocket first because a single person can never do the entire job your business needs and hire a whole team of search engine marketing is quite costly. So you should choose your option safely and beware of frauds because this area of marketing is still relatively new and cases of fraud are far too high than considering normal because people don’t have sufficient knowledge of the concept and all the things it includes. You can only hire a great in-house search engine marketer if you know how much you can spend on this job. SEM (search engine marketing) skills are as important as budget the cost, if not more than that. What is the use of a search engine marketer if the person does not possess SEM skills or what good such employee does for the business? Skills are the important factor in hiring a great in-house search engine marketer or outsource like SEM agencies. Excel and Google spreadsheet are one of the skills of SEM because bulk data, uploading, marketing are the core job of the SEM. There are other skills that play important role in the life of a SEM person like management, multitasking, understanding and knowledge of latest trend. In reality, search engine marketer is expected to have mastery in more than one skill which usually came from experience, learning and time spent on the job. When it comes to hiring a great search engine marketer SEM skills make the real difference, so basically if you want to hire a great search engine marketer to focus on the skills of the candidate and what they know and how willing they are to learn. The experience could be something you find rare in the field of SEO and SEM because the subject of search engine marketing and search engine optimization still has the freshness. There are people out there with experience in these fields, but candidates are not available in large numbers and that’s why the experience has such importance in this job. When you choose to hire an in-house search engine marketer, you look for the experience because training a person for the job of SEM can be a really tiresome task as well as take time and sources. So you should focus on experience at least a few years if you want to hire a great in-house search engine marketer because little experience can save a lot of time, energy and stress for you. Learned it yourself can be a good option if you do not have money, time and sources to spend on the in-house search engine marketer and outsource agencies because of what better than doing it yourself. You know your business very well and understand the need of your business as well as can save a lot if your business is on the first stage, you can later hire help for your marketing team and train them according to your need. SEM can be tiresome specially if you have lots of responsibility but a good option for a startup business. Search engine marketing is becoming popular with every passing day because the online market is growing at a really fast pace and you need to be on top of your game if you want to succeed. Hiring an in-house search engine marketer can be a very important decision for your business so choose wisely. Never make a hasty decision on such trivial matters and keep all your senses open as well as use your instincts. We hope you can hire someone perfect for the job with the help of this article.